There’s something special about downtown New York in the afternoon sunshine. Perhaps it’s just the romanticising of a Brit abroad, but the West Village and Nolita seem to have a certain rarefied air about them on such days – relaxed, artistic, alive with possibility. It was on such an afternoon that I went to see Kirk Miller of the tailor Miller’s Oath. 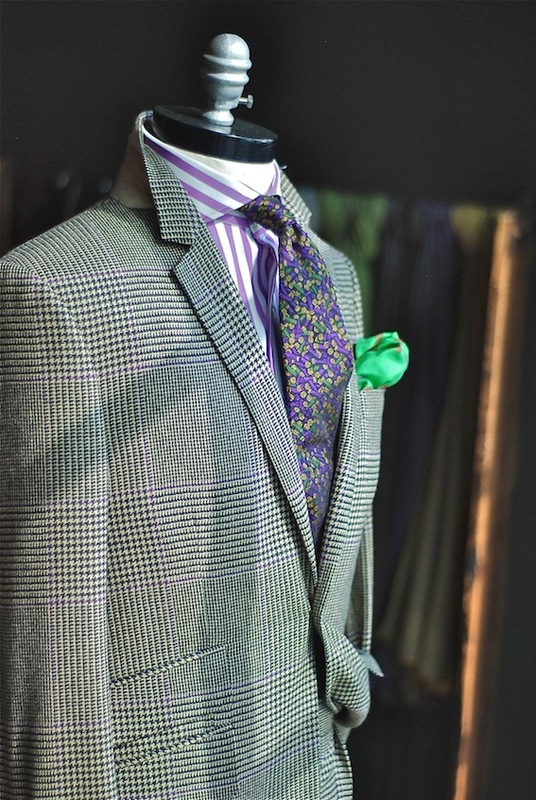 Kirk is the brother of Derrick, and used to run Barker Black with him until he launched this family-branded tailor. The oath referred to in the name is a promise to both customers and the brothers’ ancestors, who were in the clothing business. The shop has a beautiful atmosphere. 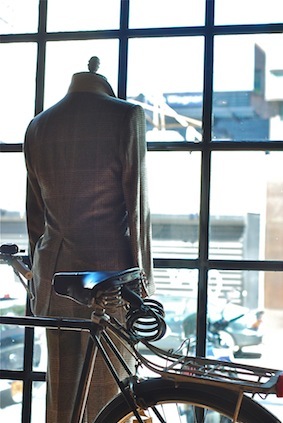 Sun pours through the big front windows on an afternoon like this, lighting up Kirk’s model jackets. He has a thing for glen check, in fact was wearing a lovely pair of heavy trousers in that pattern when we met. And the model above is obviously in a glen-check suit. It is cut, as Kirk’s normally are, with a single button and sharp cutaway, though running round to a regular-length back. Elsewhere, Miller’s Oath does some lovely accessories and shirts, all using the pick-axe insignia that relates back to the family history. As well as that promise to deliver the best to customers. Kirk is not a cutter. He is a designer and a salesman, though there is a tailor on site – basting together a jacket as we talked. The cutting for the custom (bespoke) service is done off site, though Kirk hopes soon to have the scale of business to justify a full-time cutter in the shop. As we said our goodbyes and I began walking towards the door, a souped-up Jeep parked outside began blaring out music, and frantically turned out of its spot before zooming away. Apparently this neighbour is a rather aggressive driver generally. If there isn’t a sufficiently large space to park, he will just park at right angles to the traffic and leave the car there, sticking out into the road. Such are the pains of living in such a vibrant and, to an extent, still residential neighbourhood. Kirk and I smiled, shook hands once more and I walked out into the hot afternoon sunshine. You can follow the discussion on Kirk Miller, Miller’s Oath by entering your email address in the box below. You will then receive an email every time a new comment is added. These will also contain a link to a page where you can stop the alerts, and remove all of your related data from the site. Very Interesting Information;I really like the combination of colors & patterns in the top photo…….thank you for this Incredible post Simon,I enjoyed it……. Do you know the fabric reference number in the first pic? Fantastic! 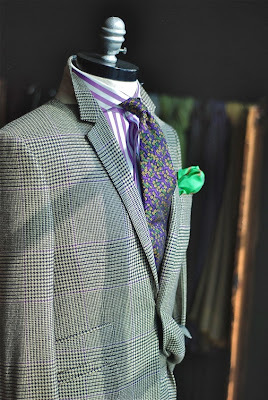 Kirk Miller deserves more press in the menswear blogosphere. Awesome shop.